I love checking out stores and restaurants for design inspiration - there are small space ideas everywhere! This week's LA Times profile on Tory Burch's Malibu outpost is definitely design worthy. I especially love the ikat fabric draping all of the furniture - yes! Consider making over your space with bold and graphic prints of you are choosing a neutral base color palette. Accent pieces - like an ikat ottoman - will make the space feel rich and full of design style. And check out the symmetry and balance of the side tables, mirrors and lamps. When going bold with prints, use scale and balance to make the space feel comfortable and grounded. Ikat is the new polka dot! It's everywhere and I love it. 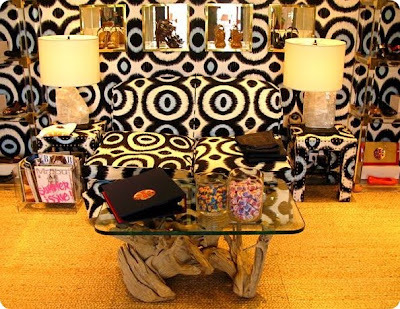 These Ikat designs are really inspiring.